A new Augmented Virtual Reality Lab will be incorporated into the curriculum in Northeast Tech’s popular Business Administration, Multimedia and Graphics (BAMG) program. Other Northeast Tech instructors Trishia Masterson (right) and Keith Glenn (second from right) joined BAMG Instructor Kali Ward (center) for a training session with the new equipment. Thanks to a $50,000 grant, Instructor Kali Ward is incorporating a virtual reality lab into her curriculum at Northeast Tech. Augmented Virtual Reality (AVR) is an emerging technology being used in classroom settings to provide students with immersive, 3D experiences on topics normally presented in a two-dimensional realm. Ward oversees the Business Administration, Multimedia and Graphics (BAMG) program at Northeast Tech’s Afton Campus. One of the most complex programs offered at Northeast Tech, students in Ward’s class train in everything from graphic design and computer programming to web design and now, virtual reality. “I partnered with 3DreamStudios out of Owasso to purchase the complete lab which includes a Zspace computer, 3D projector, and 3DreamStudio's custom Virtual Reality Education System database, a HTC Vive Headset, 10 Oculus Go's and a 3D printer,” Ward said. Funding for the technology comes from a High Growth and Emerging Technologies Grant for which Ward applied and was awarded, but the idea of incorporating virtual reality technology into her program came from Ward’s advisory committee. Aside from giving students the technical skills they need to prepare for certifications and the workplace, Northeast Tech’s new AVR Lab will also strengthen and expand community partnerships. The projected demand for multimedia artists and animators in Oklahoma will increase by five percent from 2012 to 2024. The median wage in 2016 was $65,300 nationally and $50,200 for workers in Oklahoma, while workers in the top 10% earned an average of around $74,080 in Oklahoma. Ward is confident the new technology will improve her students job outlook, but the BAMG students won’t be the only ones who benefit from the new technology. 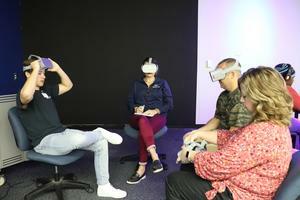 Instructors of programs such as health careers, pre-engineering and electrical technology are also trying to find ways to utilize virtual reality in their classrooms.